Sixty-six million years ago, dinosaurs had the ultimate bad day. With a devastating asteroid impact, a reign that had lasted 180 million years was abruptly ended. Prof Paul Barrett, a dinosaur researcher at the Museum, explains what is thought to have happened the day the dinosaurs died. In 1980, Nobel Prize-winning physicist Luis Walter Alvarez and his geologist son Walter published a theory that a historic layer of iridium-rich clay was caused by a large asteroid colliding with Earth. The instantaneous devastation in the immediate vicinity and the widespread secondary effects of an asteroid impact were considered to be why the dinosaurs died out so suddenly. Asteroids are large, rocky bodies that orbit the Sun. They range from a few to hundreds of metres in diameter. Any fragment of an asteroid that survives landing on Earth becomes known as a meteorite. The Alvarez hypothesis was initially controversial, but it is now the most widely accepted theory for the mass extinction at the end of the Mesozoic Era. The impact site, known as the Chicxulub crater, is centred on the Yucatán Peninsula in Mexico. The asteroid is thought to have been between 10 and 15 kilometres wide, but the velocity of its collision caused the creation of a much larger crater, 150 kilometres in diameter - the second-largest crater on the planet. The dinosaur-killing crash threw huge amounts of debris into the air and caused massive tidal waves to wash over parts of the American continents. There is also evidence of substantial fires from that point in history. For a long time it was thought that the non-bird dinosaurs died out 65 million years ago. But Paul explains, 'The dating of those layers of clay around the world is very accurate - it's estimated to within a couple of thousands of years. What caused global mass extinctions? Around 75% of Earth's animals, including dinosaurs, suddenly died out at the same point in time. So how was it all caused by a rock hurtling into the coast of Central America? Paul explains, 'The asteroid hit at high velocity and effectively vaporised. It made a huge crater, so in the immediate area there was total devastation. A huge blast wave and heatwave went out and it threw vast amounts of material up into the atmosphere. Like dominos, this trailed up the food chain, causing the ecosystem to collapse. The reduction in plant life had a huge impact on herbivores' ability to survive, which in turn meant that carnivores would also have suffered from having less food available. Breeding seasons would have been shorter and conditions harsher. All living things would have been affected in some way, both on land and in the ocean. 'There is a lot of discussion over the actual kill mechanism and how long that period lasted. There are still a lot of unknowns. But it was a massive event affecting all life on Earth, from microorganisms all the way through to dinosaurs,' says Paul. The casualty list is long. Among them, ammonites, some microscopic plankton, and large marine reptiles all died out. But the loss made room for the beginnings of the modern world. The blame can't solely rest on the asteroid. Prior to its crash landing, Earth was experiencing a period of climate change. This was making things harder for life on our planet. In what is now central India, there was substantial volcanic activity that, although unrelated to the asteroid impact, was causing problems of its own. The resulting lava outcrop is now known as the Deccan Traps. Paul says, 'For two million years there was a huge amount of volcanic activity going on, spewing gases into the atmosphere and having a major impact on global climate. The last non-bird dinosaurs were living at a time of environmental change, some of which began millions of years before they went extinct. The asteroid was the final, killer blow. What survived the asteroid impact? During the Cretaceous extinction event, plants were less affected than animals because their seeds and pollen can survive harsh periods for longer. After the dinosaurs' extinction, flowering plants dominated Earth, continuing a process that had started in the Cretaceous, and continue to do so today. But all land animals weighing over 25 kilogrammes died out. 'What we're left with are basically the seeds of what we have today. Many of the major animal groups that are alive today were in place before the asteroid impact and they all suffered some level of extinction - but the lines that led to modern animals got through,' says Paul. Initially the survivors were small, with birds the first to experience evolution to larger sizes. There were a couple of lineages of gigantic birds - predatory and herbivorous - but they weren't around for very long and also went extinct. This is a fossilised skull of a large flightless bird that lived during the Eocene Epoch. This specimen is around 50-55 million years old. Dinosaurs remain the largest land animals ever to have lived. The only animals that have ever exceeded their size are whales. There is research to suggest that if the impact had occurred elsewhere on the planet, the fate of life on Earth could have been very different. If it had fallen just minutes later the asteroid would have landed in deeper water, causing less rock to vaporise and rise to block out the Sun's light and warmth. This would have lowered the chances of a mass extinction. But if the dinosaurs' reign hadn't been abruptly ended by an asteroid, Paul thinks that we might have seen some (other than birds) around today. 'I suspect some of them would still be around. We don't know a lot about the last 10 million years of their reign and what we do know is based on only one area in the world, western North America. 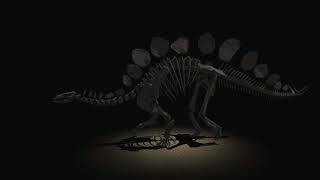 There is a really good record of those classic last non-bird dinosaurs like Tyrannosaurus and Triceratops. 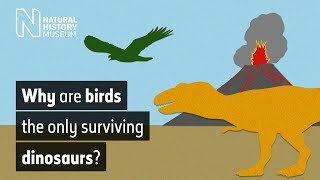 Were it not for the asteroid, dinosaurs might have survived a little longer, although with modern birds, mammals and reptiles starting to develop, they may not have dominated as they once did. Visit the Museum's Dinosaurs gallery and see the ancient animals that once roamed Earth. Is a mosquito trapped in amber really the way to bring dinosaurs back from the dead?